This year’s drought has wreaked all sorts of havoc on the price of basic foods, and holiday fare hasn’t escaped its wrath. According to the latest Consumer Price Index, poultry is nearly 5 percent costlier this year than last, with turkey prices up 6 percent. 1. Go Small for Savings: Bigger isn’t always better, especially when price is determined by weight. Given all the scrumptious sides to be had on Thanksgiving, buying a smaller bird will be good for both your waistline and your bank account. 2. Be an Early Bird: Buy now for the best prices on turkey — inventory is at its highest and you can buy multiple birds if you plan a turkey dinner do-over for Christmas. Peruse deals using the Coupon Sherpa mobile app to determine which store has the best prices, and remember some stores will price-match their competitors. 3. 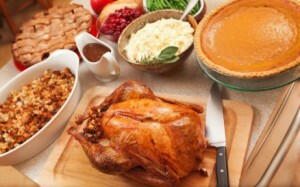 Ask About Promotions: Some supermarkets offer a free or deeply discounted turkey when shoppers spend a certain amount. For example, select locations of Safeway are offering frozen turkeys for $7.99 (up to 16 lbs) with store purchases of $25. Chat with the manager at the store you frequent to learn about their upcoming promotions on turkeys. 4. Avoid Paying for Everything: Let’s face it, the cost of Thanksgiving isn’t limited to the main course. If you’re hosting the holiday this year, ask attendees to bring their favorite dish to share, freeing up your funds for the main event. 5. Don’t Fret; Fix: Listen, we’ve all been there. You’ve labored over the main course all day only to find it undercooked, overcooked or just plain tasteless upon serving. Never fear, for Food & Wine has several tips to help you save face and salvage the bird. 6. Borrow Servingware: If your cutlery, serving ware and baking supplies aren’t quite up to snuff for a Thanksgiving feast, borrow items from friends and family. Buying these items all at once during the holidays can be costly, so opt for stocking up gradually and relying on others in the interim. It’s the season of sharing, after all. 7. DIY for Taste and Savings: All that chopping, measuring and waiting can become tedious, but when else can you spend an entire day making a multi-course meal that’s consumed in 20 minutes? While you might be tempted to go the pre-chopped, pre-baked route for the sake of convenience, remember these items are marked up between 40 and 100 percent. Keep your budget and taste buds in check by making these dishes from scratch. 8. Buy Booze in Bulk: Warehouse stores like Costco and Sam’s Club are a thrifty resource for booze, as buying them in bulk can save you up to 30 percent over grocery store prices. Better yet, ask your guests to contribute their favorite beverage to reduce your costs even further. 9. Less is More with Decor: Everybody loves holiday decor, but there’s a thin line between festive and a cornucopia of clutter. For the sake of your sanity and your checkbook, keep the decor subtle. Find one key piece that you love — like a fall centerpiece or natural-fiber turkey — and make sure it integrates well with your everyday decor.